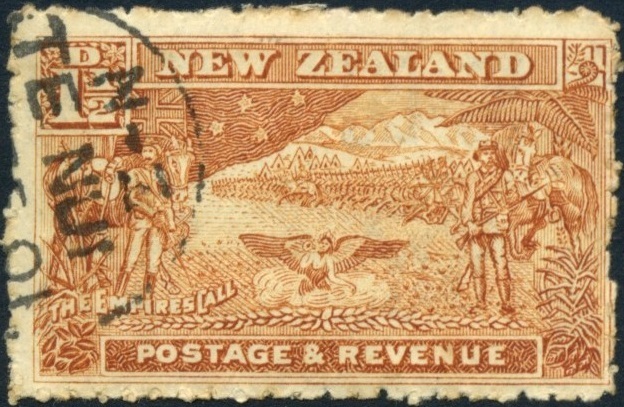 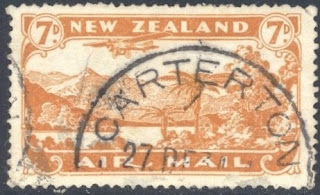 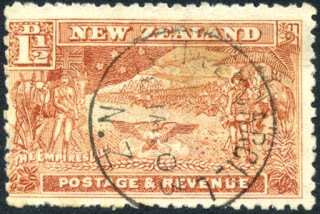 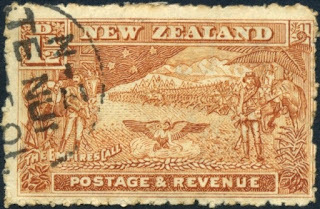 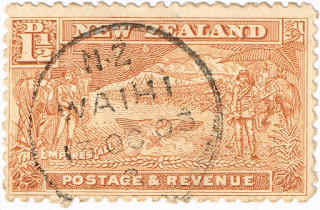 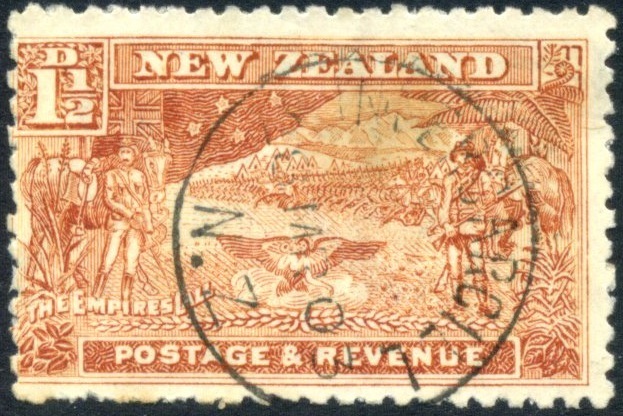 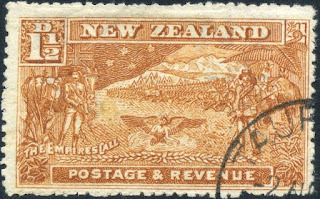 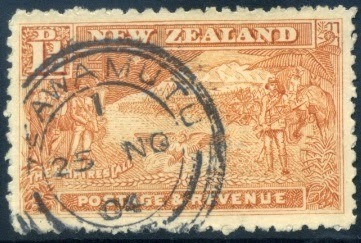 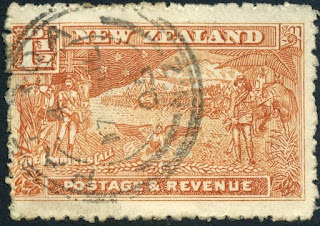 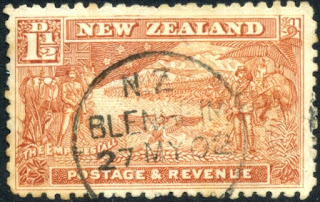 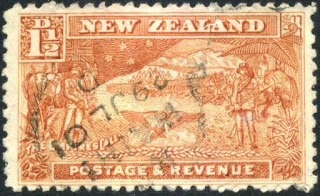 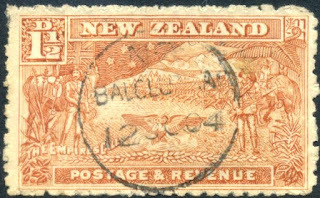 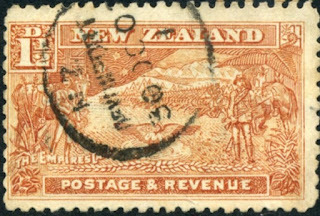 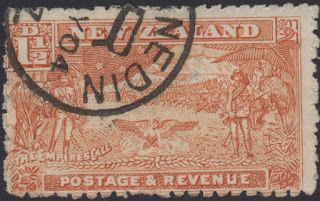 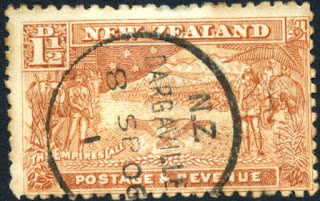 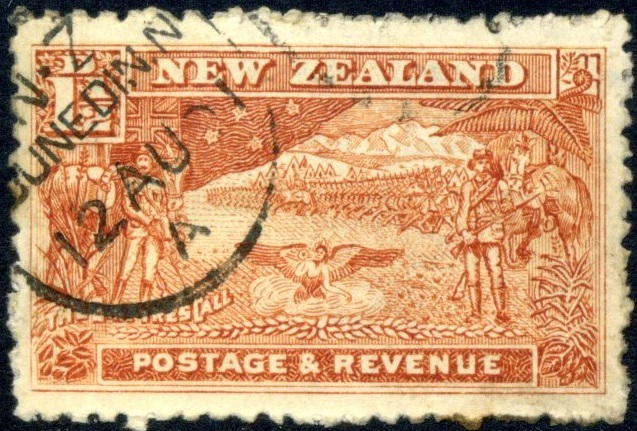 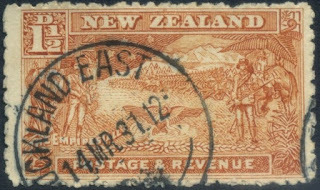 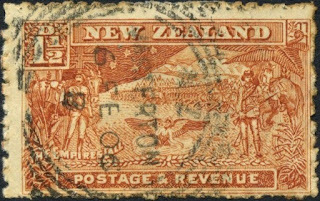 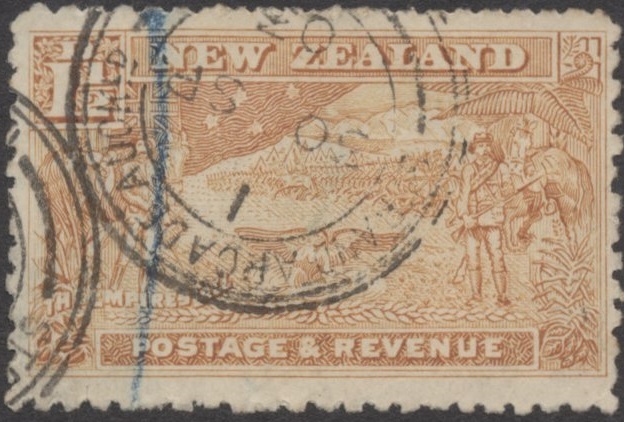 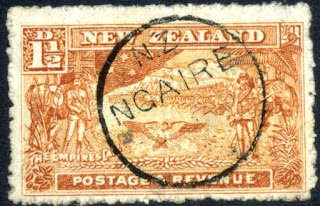 Virtual New Zealand Stamps: 1900 Boer War Thematic Collection. 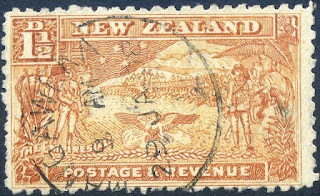 1900 Boer War Thematic Collection. 1½d - Boer War Commemorative. See our post-1898 First Pictorial Issue. 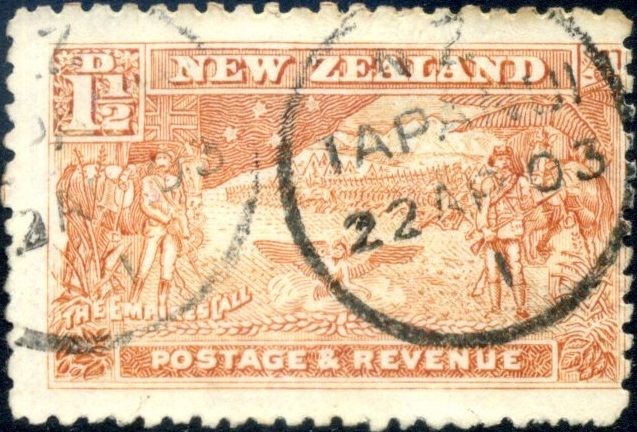 A new penny halfpenny stamp was introduced to cover a change in postage rates for printed matter. 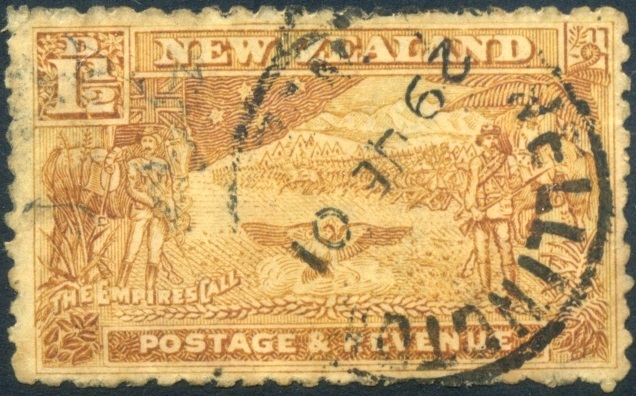 It commemorated the departure of the first contingents of New Zealand troops to the Boer War in South Africa and symbolised the prompt response of New Zealand to the call of the Empire for troops. A total of 6,500 New Zealand troops took part. 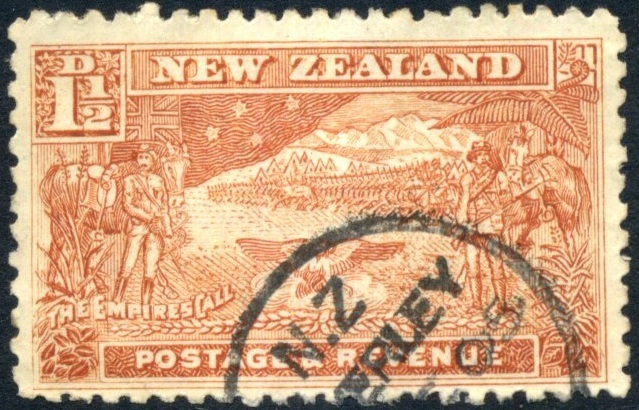 Rather ironically, the stamp was the first to be engraved outside the British Empire, in New York. 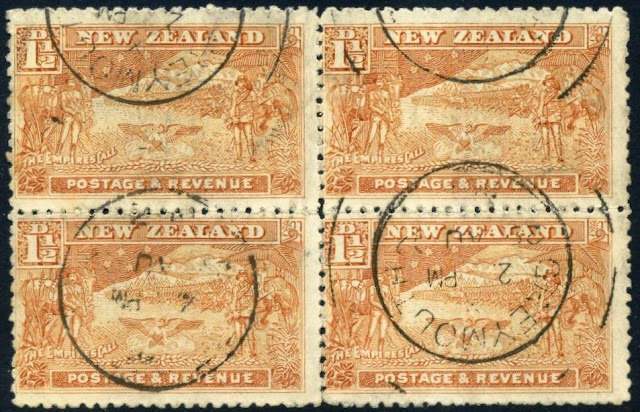 A Collection of Postal Cancels on this 1900 stamp. 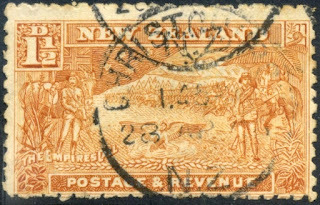 While Allan was searching for good examples of this stamp for another post, 1900 Boer War, he came across a small collection of 11 used stamps, cancelled in 11 different post offices. Since then we have found more, readable post cancellations so now we have a collection of over 50 items.﻿ Now this collection has become so large that the decision has been made to split it onto its own blog page. Auckland, East. 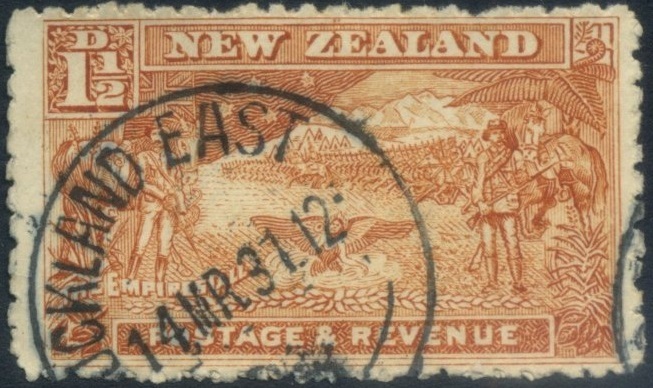 Auckland, Strand Arcade. 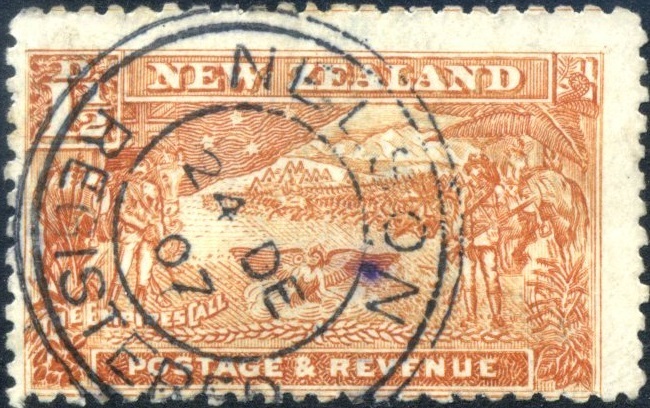 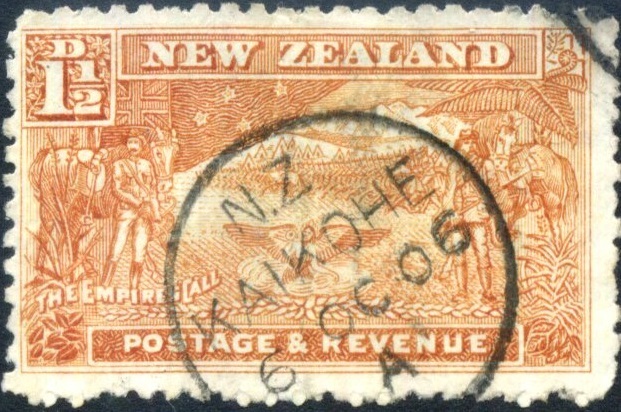 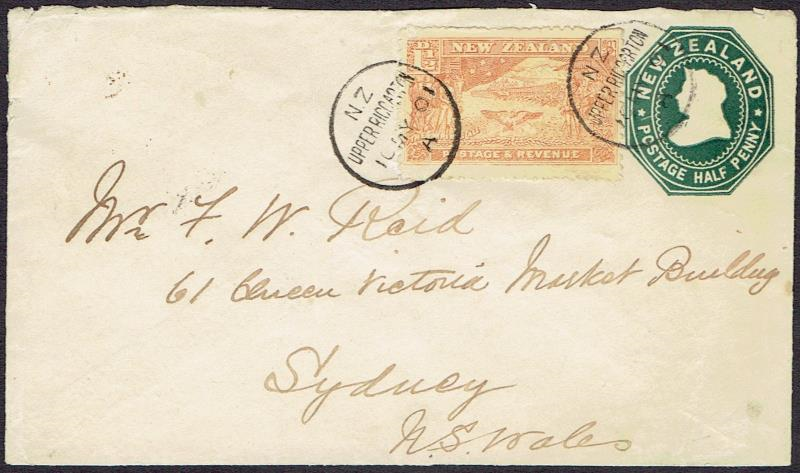 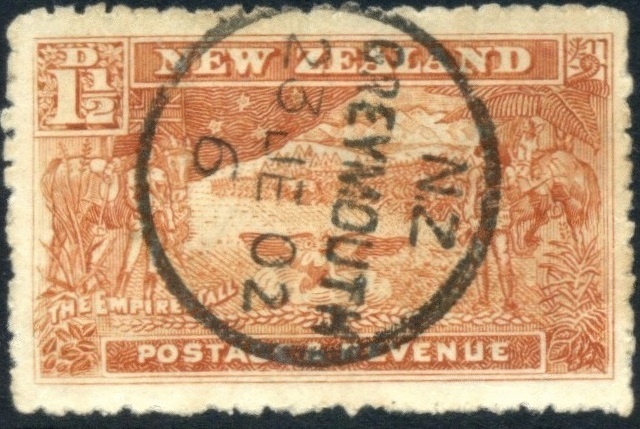 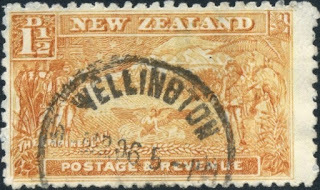 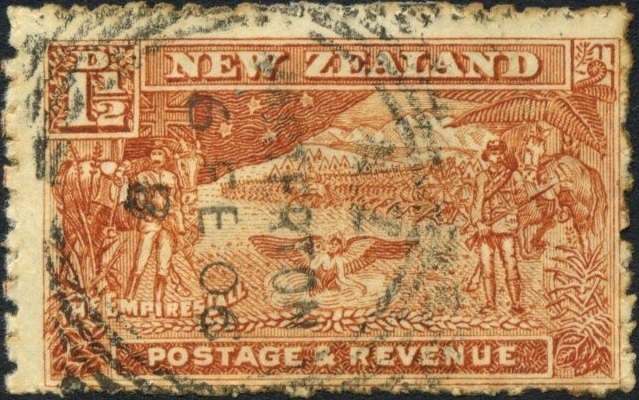 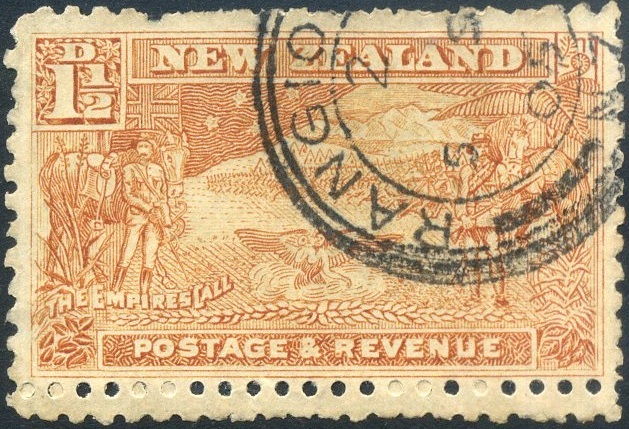 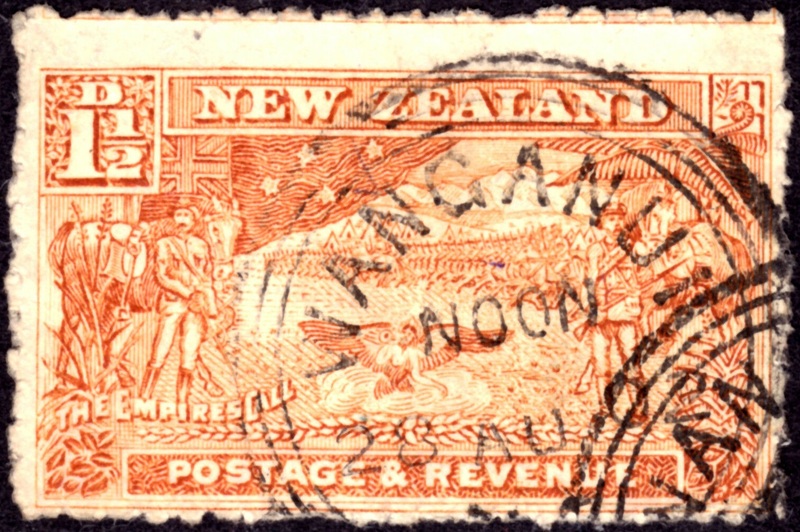 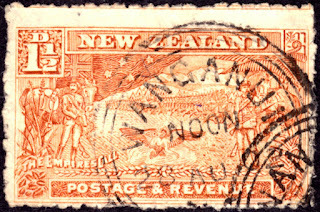 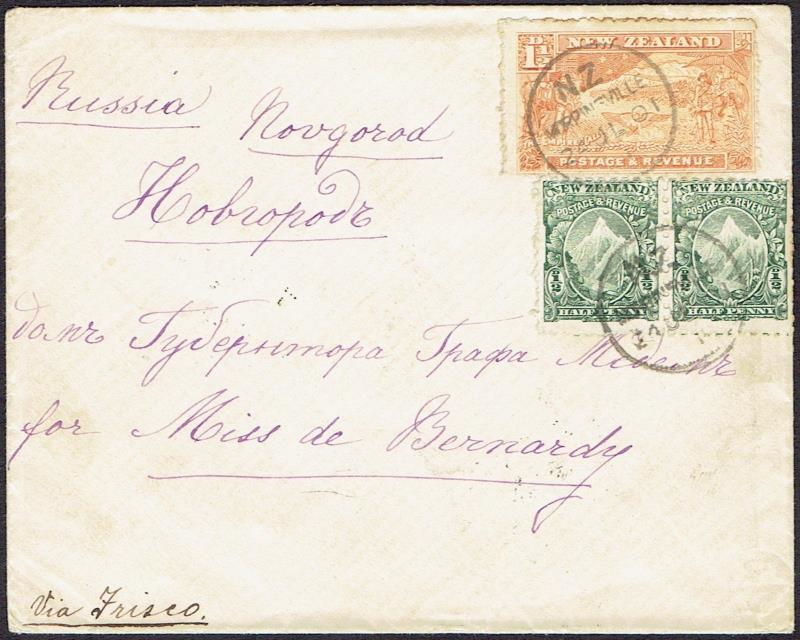 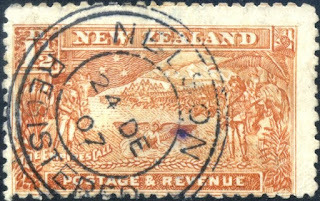 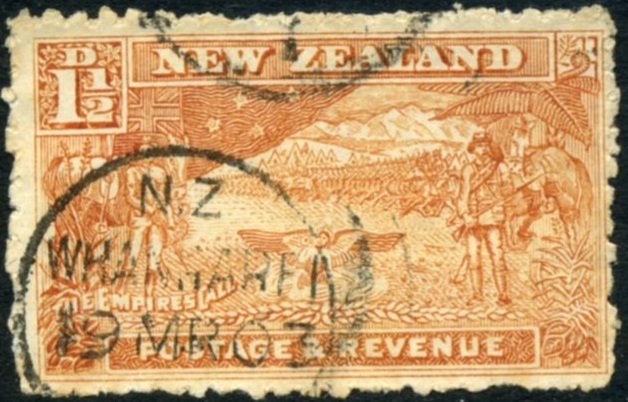 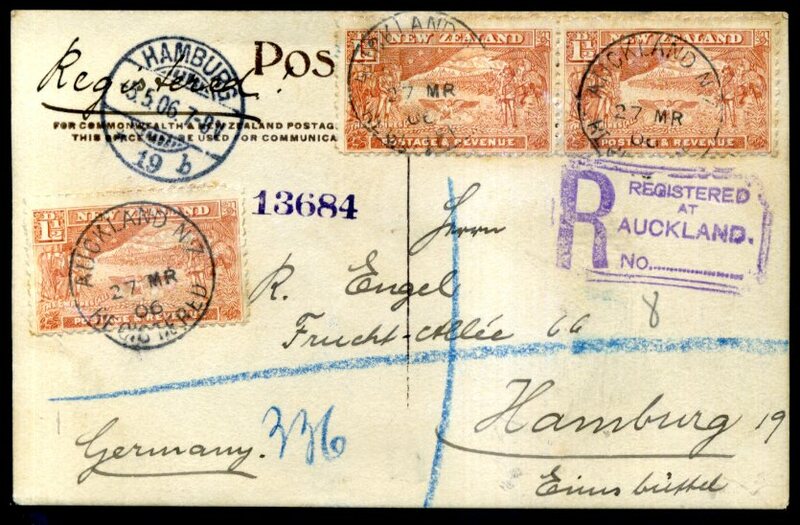 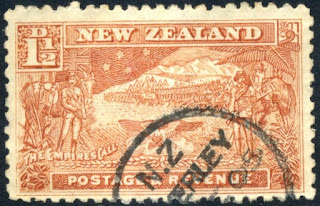 1906 Reg Cover Auckland to Hamburg, Germany. 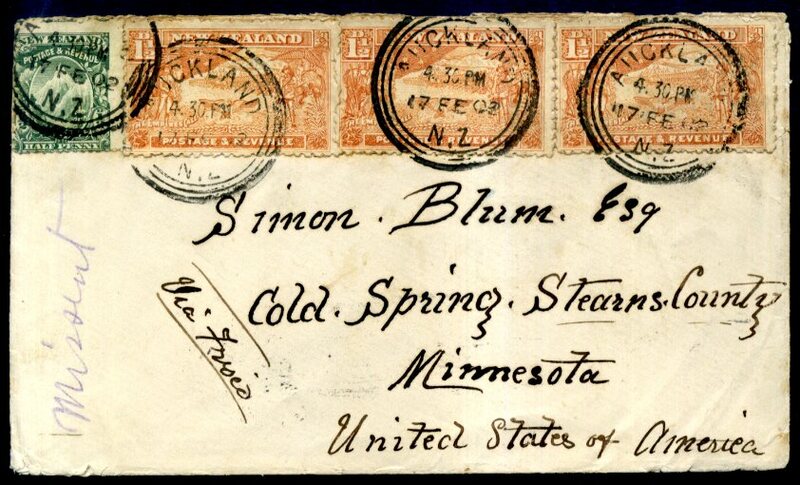 1902 Auckland to Mimnesota, United States. 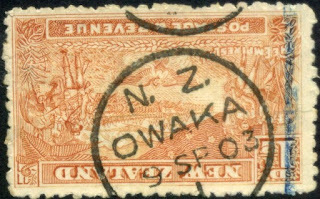 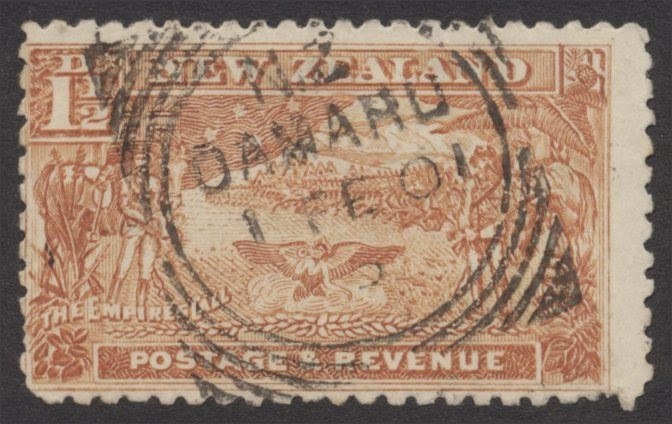 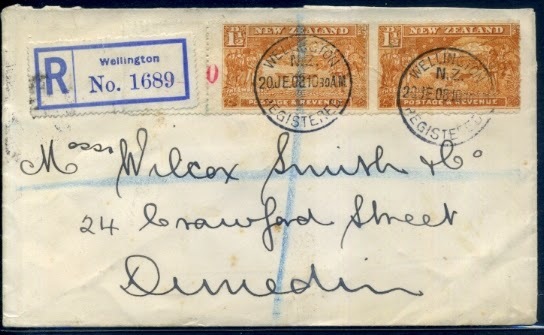 1904 Awamoko registered cover to Dunedin. 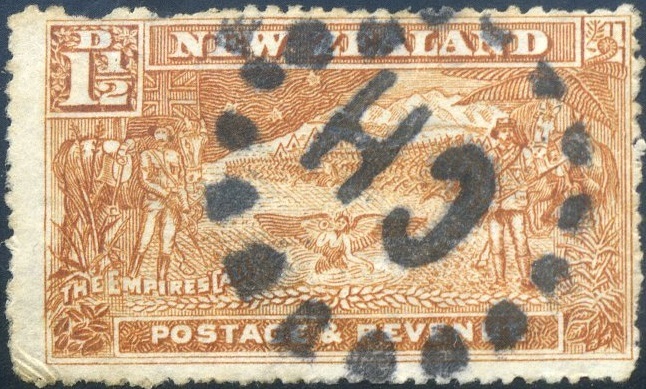 2x 1½d Boer War. 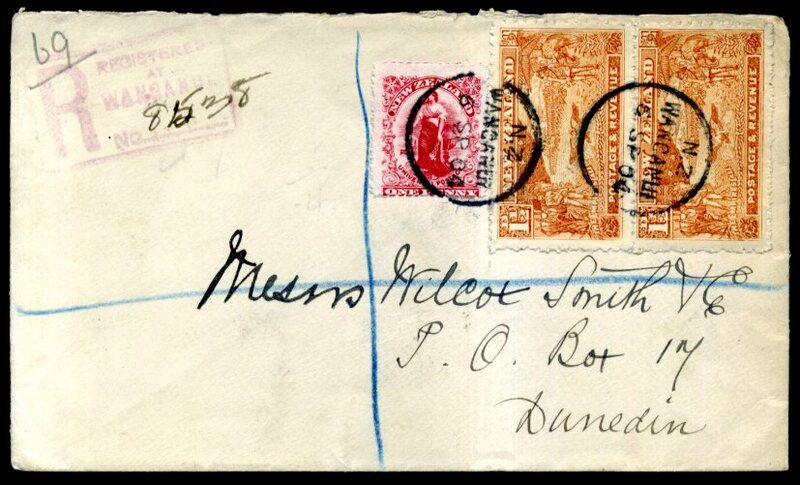 1902 Dunedin registered cover local mail, bearing 1½d Boer War X 3 copies plus ½d Mt Cook. Fanning Island or Fanning Atoll. Tabuaeran or Tahanea, known in English as Fanning Atoll (both Gilbertese and English names are recognised), is an atoll that is part of the Line Islands of the central Pacific Ocean and part of Kiribati. 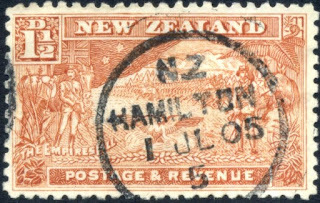 Hamilton - This stamp appears to be imperforated, hand cut from a sheet. 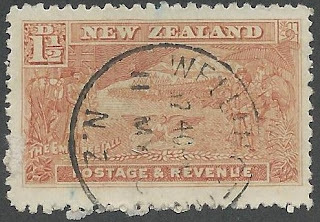 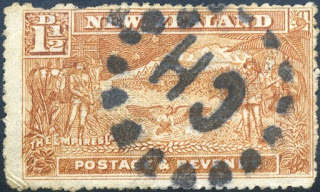 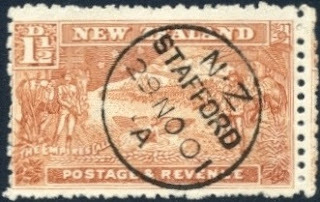 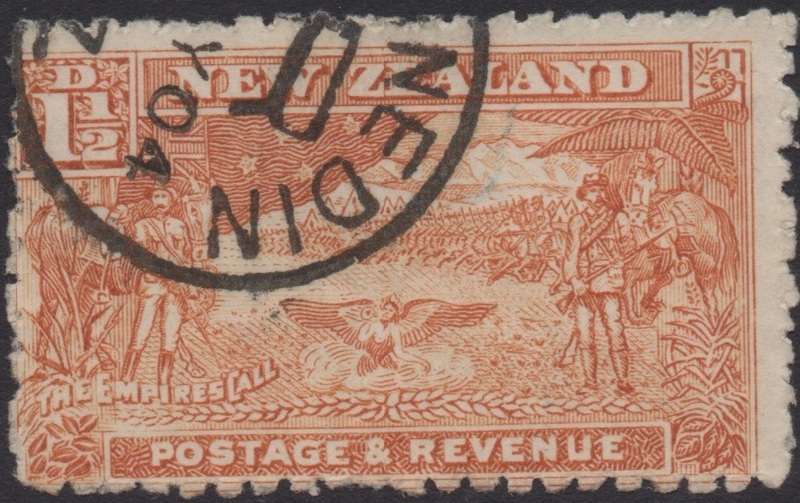 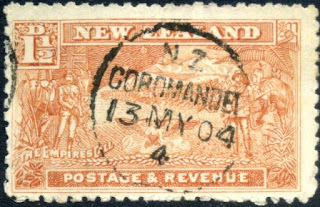 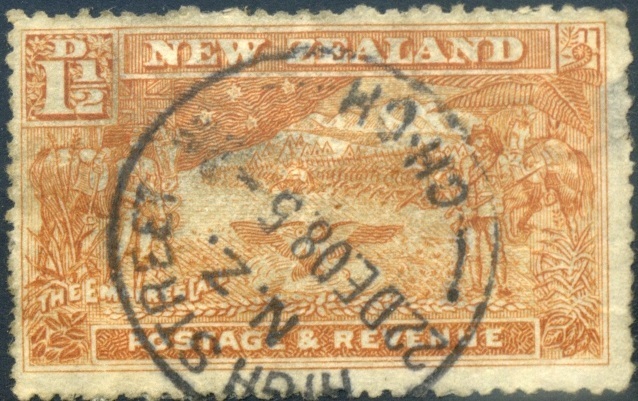 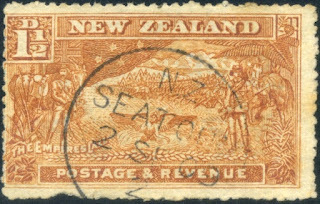 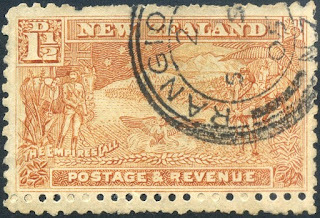 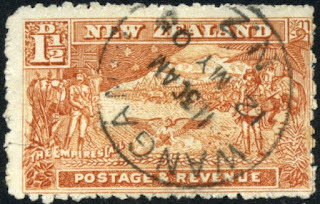 Yes, I know Hobart is not in New Zealand but this cancel was applied when it was discovered more postage was required. 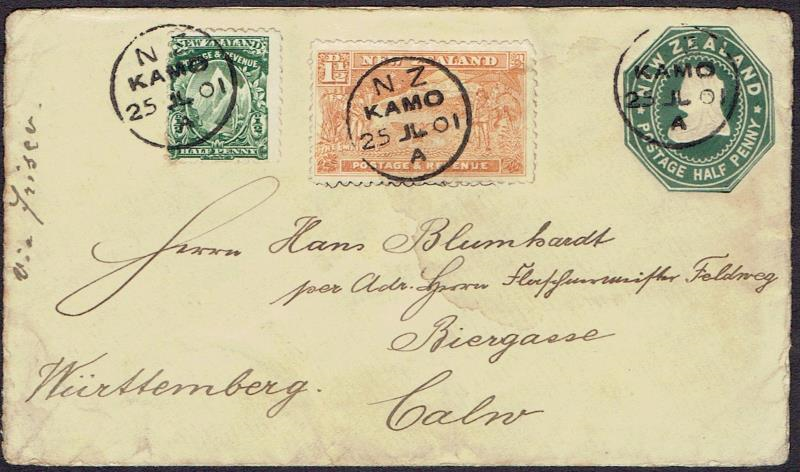 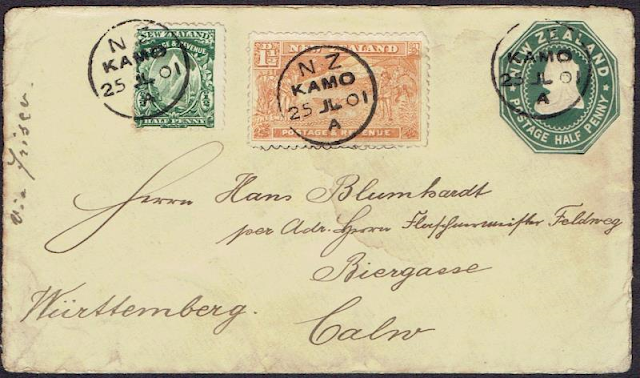 Kamo on a cover - 25 July 1901 Kamo, to Calw, Württemberg. 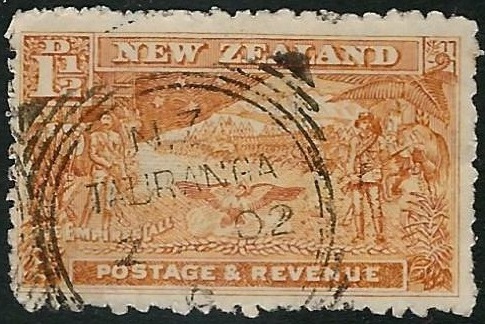 Ngaire - Taranaki town that was corrected from Ngaire to Ngaere in 1909. 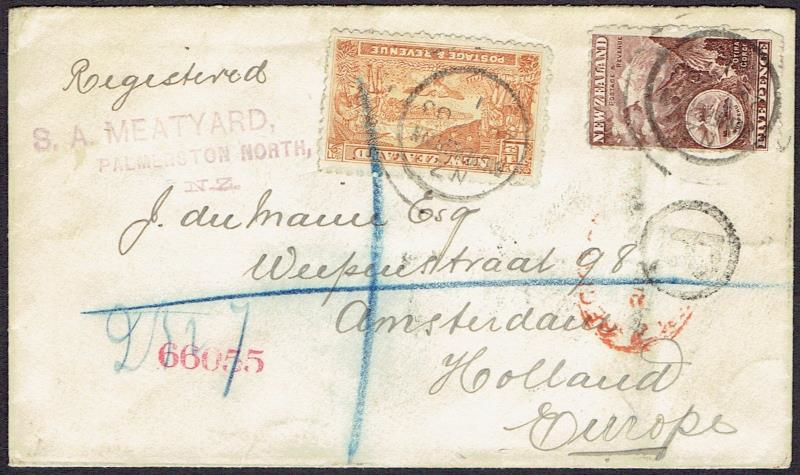 Palmerston North to Holland cover. 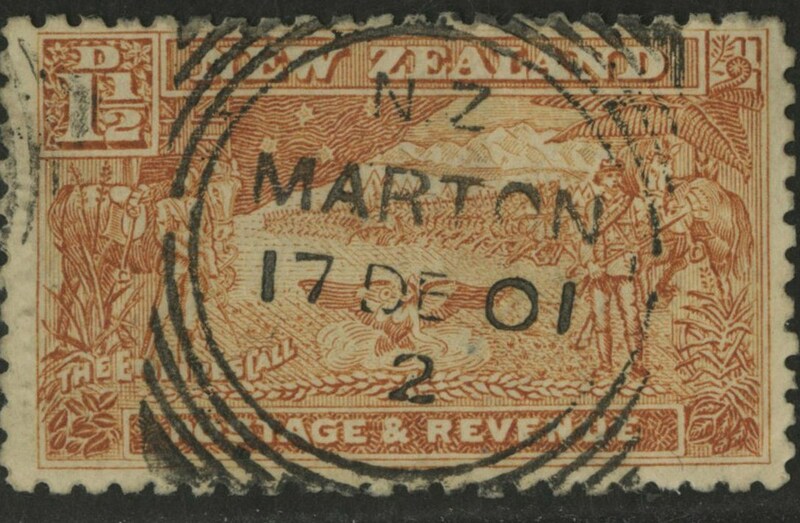 Upper Riccarton to Sydney, New South Wales, Australia. 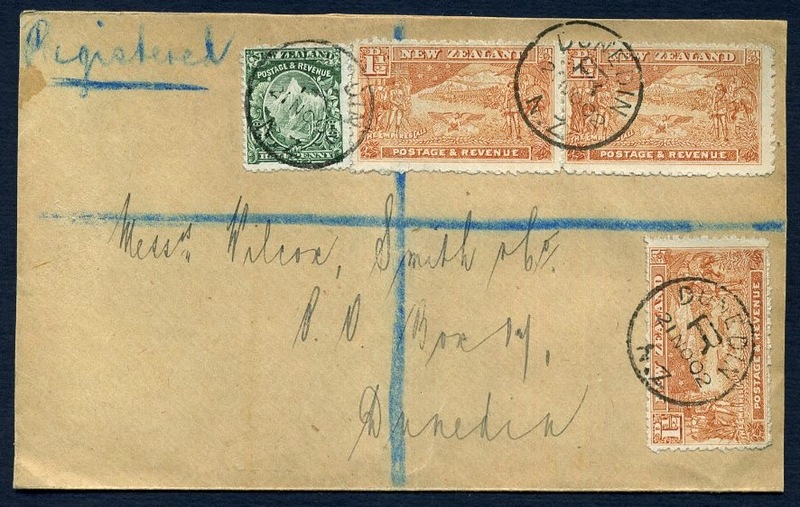 1908 1½d Boer War stamps on a registered cover sent from Wellington to Dunedin, 20nd June 1908. 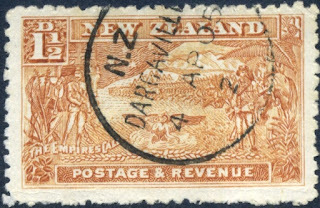 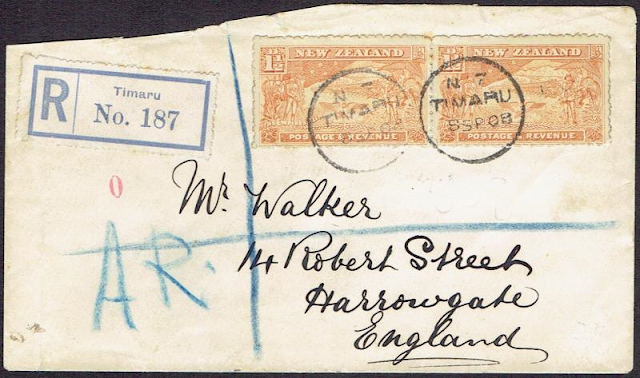 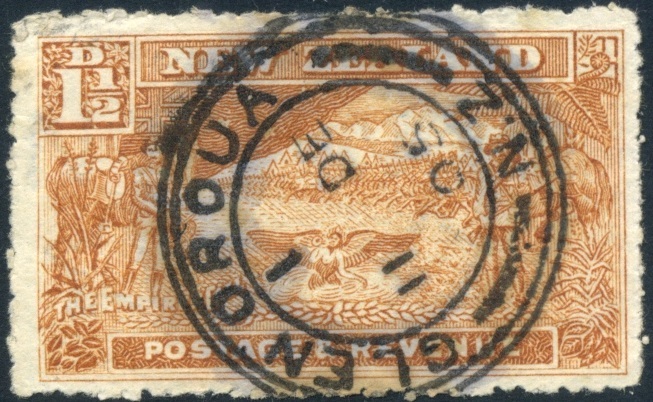 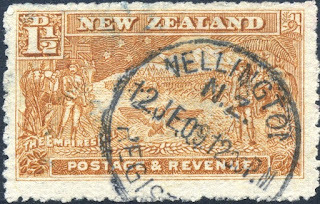 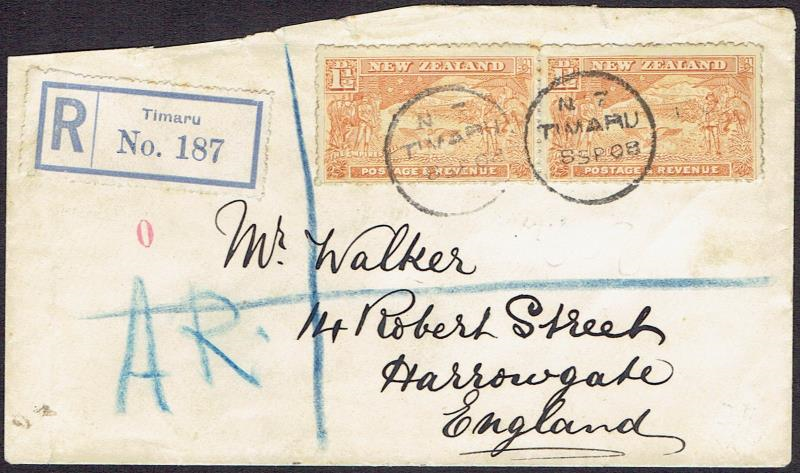 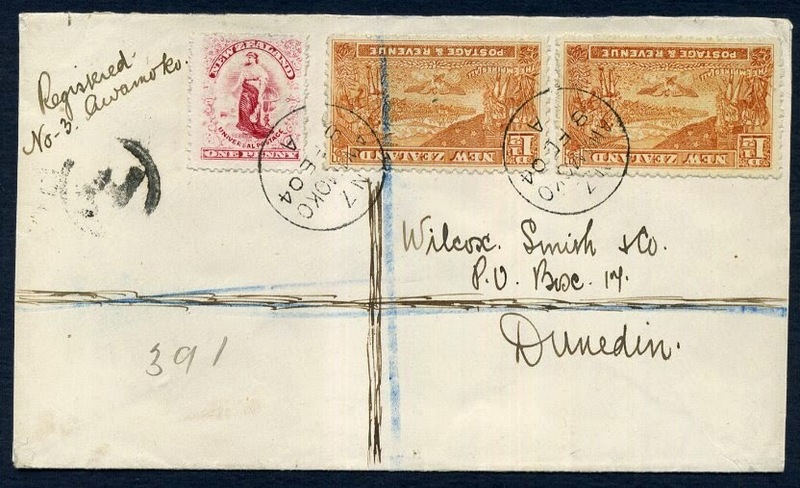 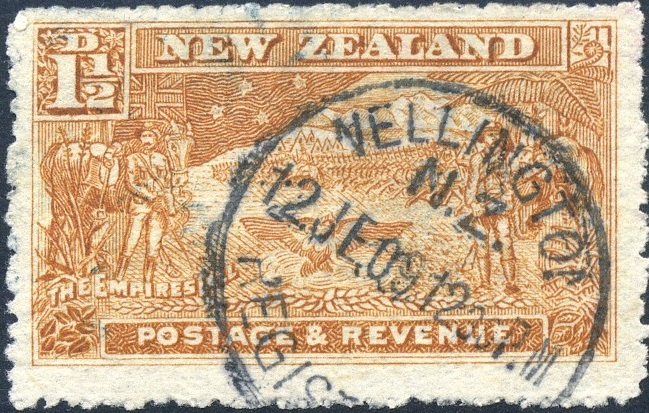 Whangarei to Barbados, West Indies cover. 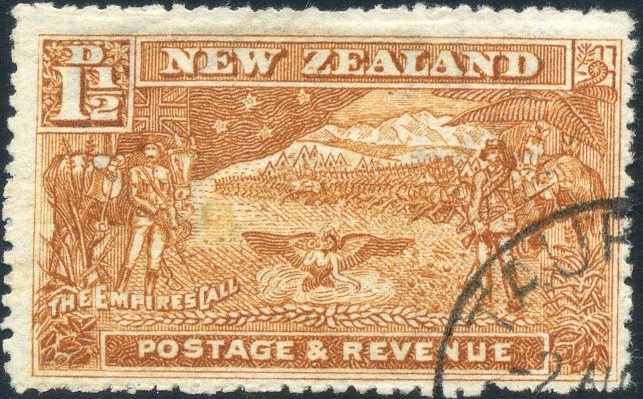 This is something different. 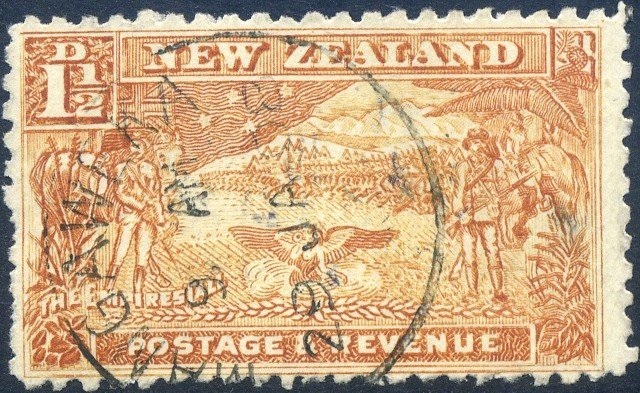 A entire page about the postal cancels on one stamp. 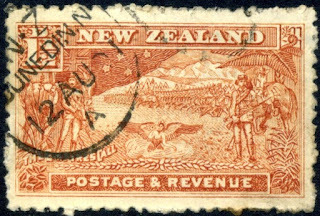 I remember seeing some of these in another page but not so many. 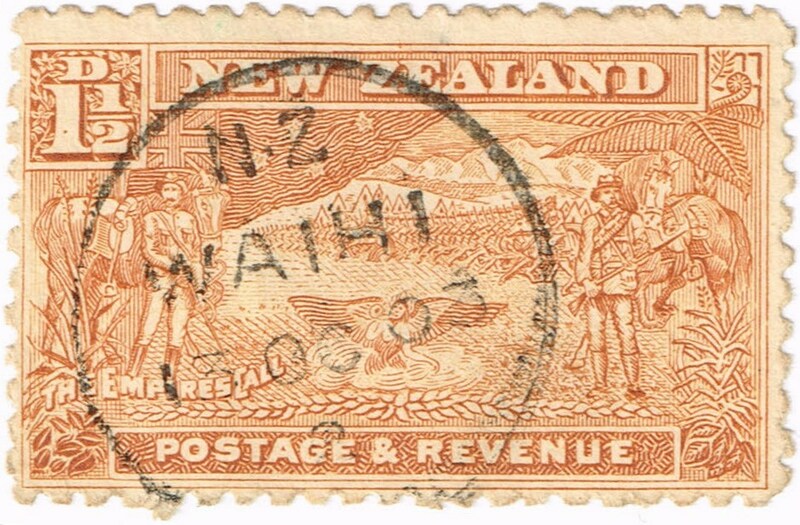 Interesting the different places. 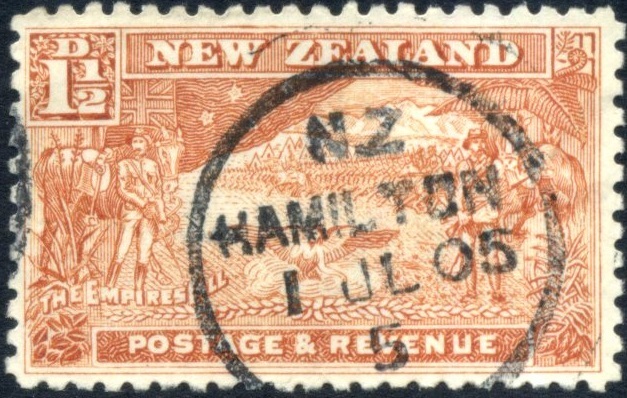 Will be good when you get your work finished Kimberley. 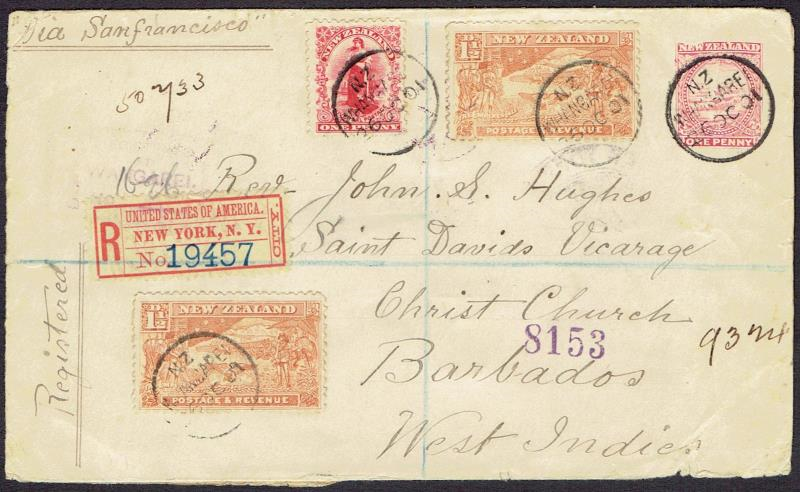 This page is shaping up well but still some work to do yet. 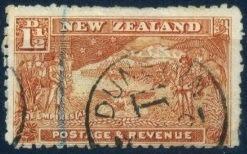 Yes, it is different. 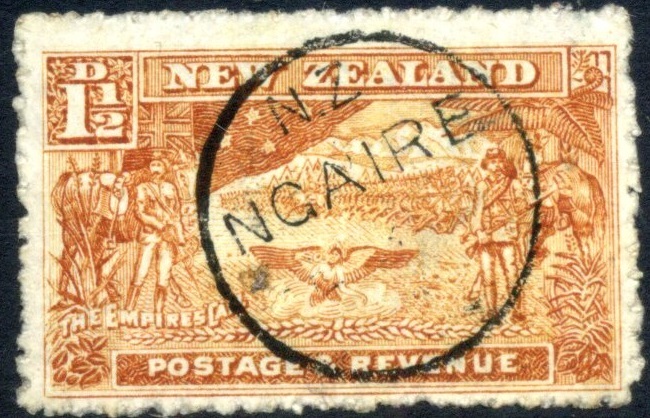 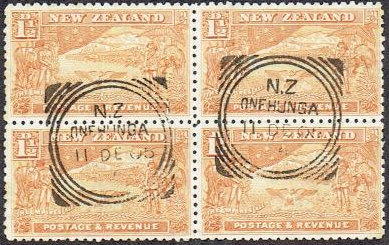 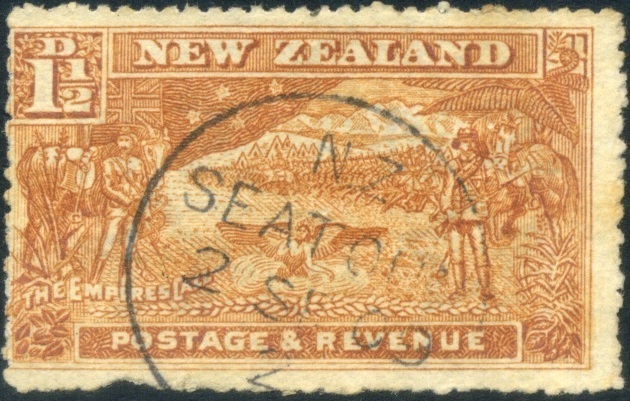 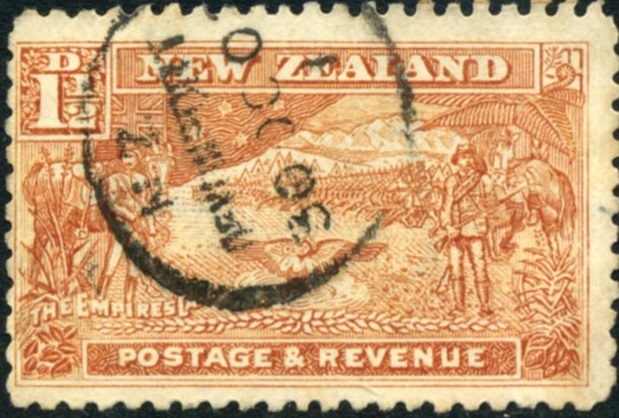 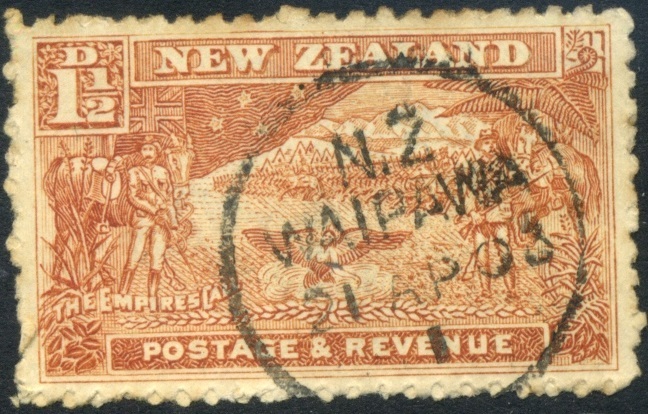 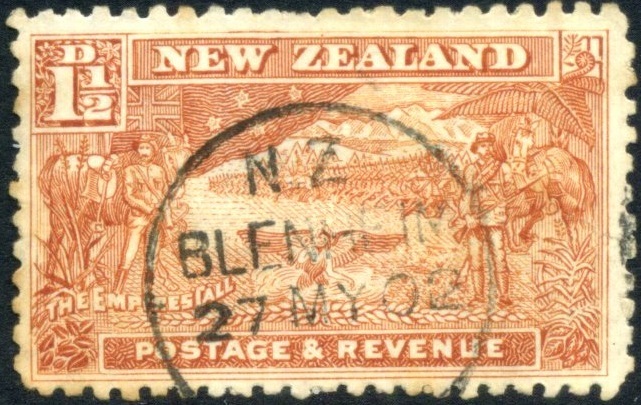 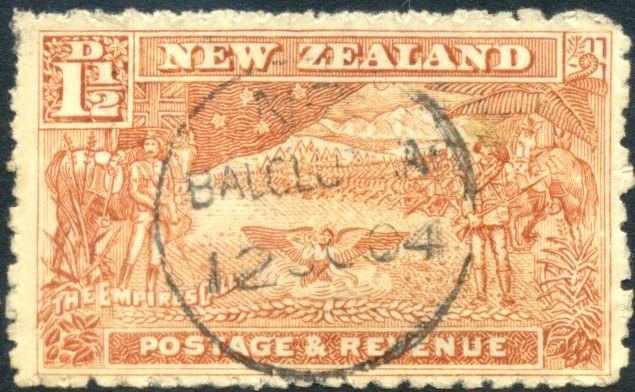 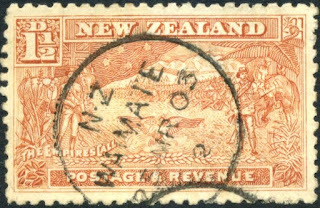 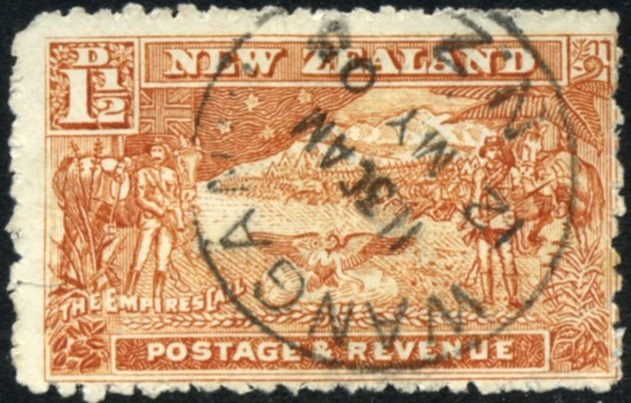 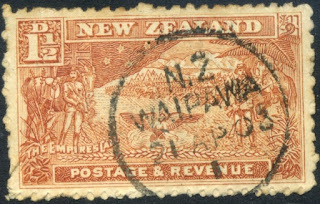 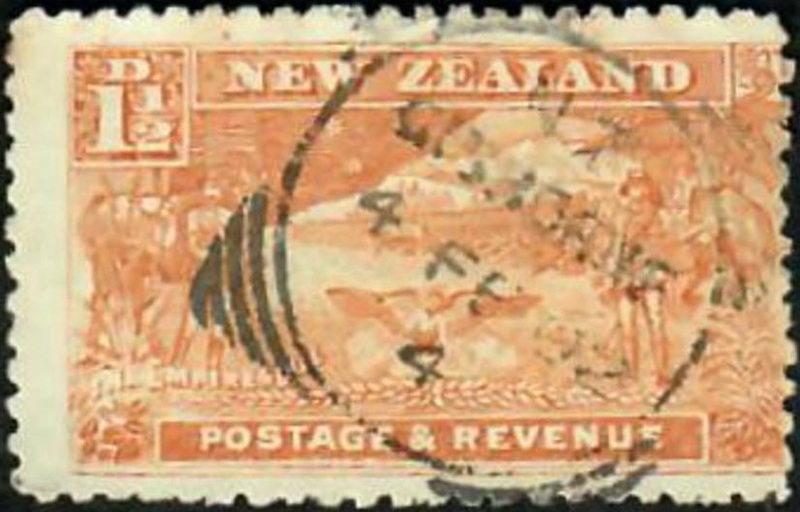 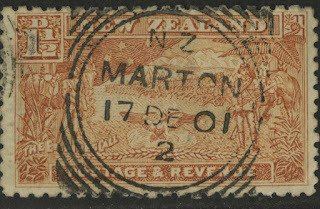 A study of the postal marks on a single stamp. 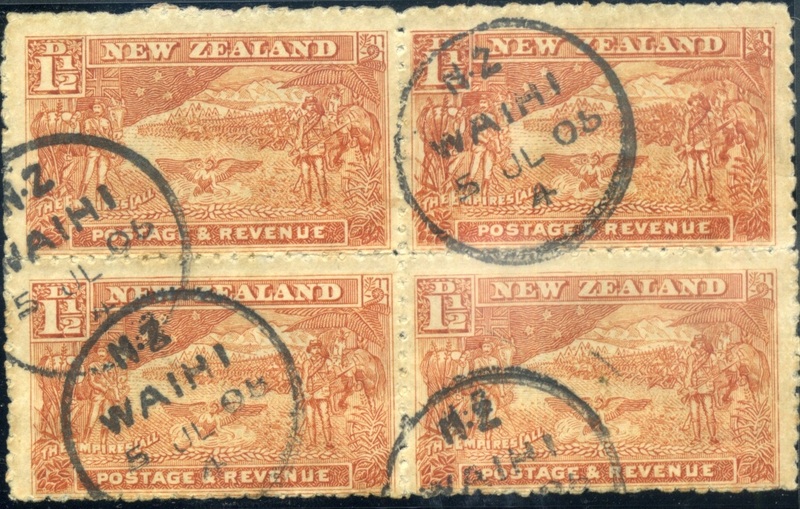 Interesting collection Allan & Kim. 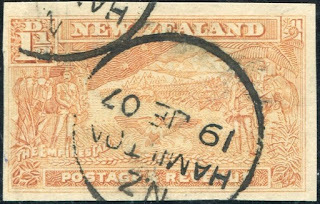 I think this collection should be included in your hall fames Special Posts page as it meets all three of the conditions of entry. 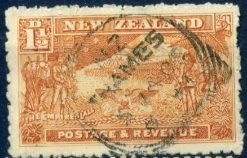 First seeing so many copies of such an old stamp is very rare. 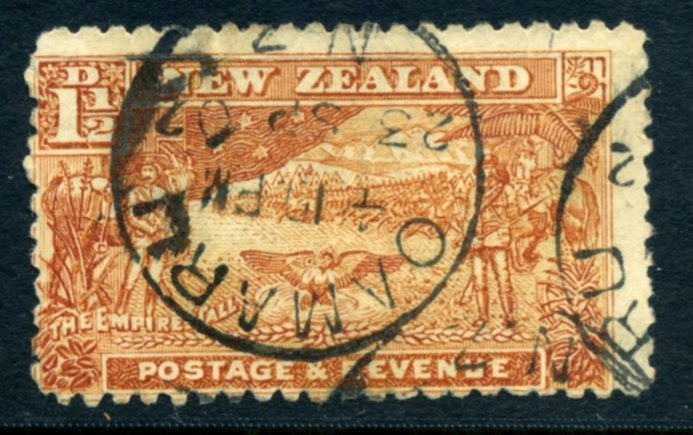 This page is very different to any other page that I know of in this blog - unigue. 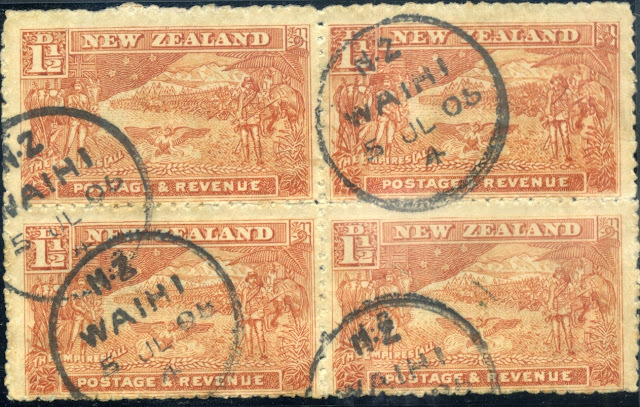 Third, it must have taken a lot to find all of these stamps and prepare them on this page. 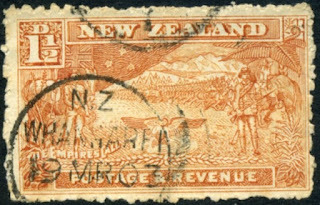 I know it has had at least three make-over including moving from being a part of another page. Thanks Graham. 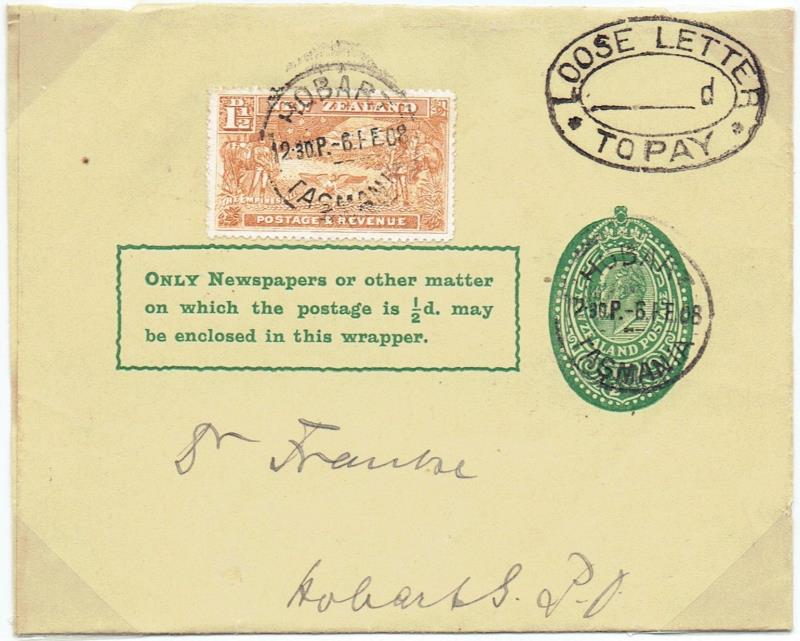 This page with is now on our special posts page. 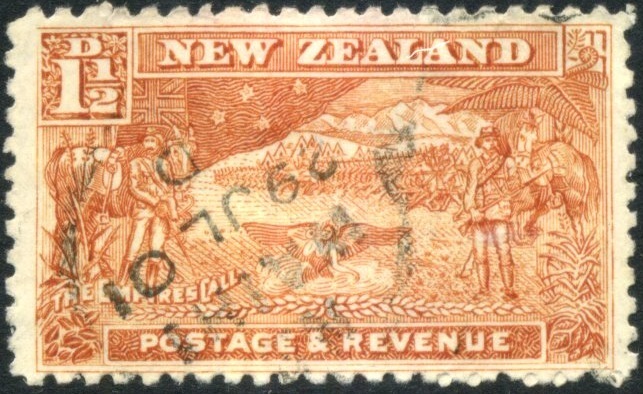 This collection is still growing. 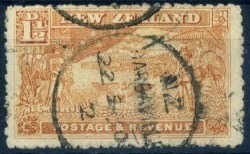 I counted 61 items just now. 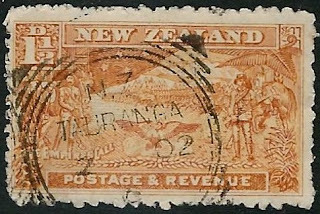 It's amazing how you are finding so many of them. 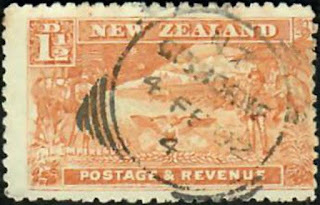 2006/2018 Year of the Dog.